Expandable Cherry Conference Tables! In Stock! Free Shipping! Your conference room will definitely be a cut above the rest with the transitional styling of our beautiful genuine Brown Cherry veneer conference tables. Our Brown Cherry series takes several species of hardwood veneers and combines them into a handsome table at an incredibly affordable Modern Office price. Feathered cherry outer edges of the table top and legs are bordered by a walnut inlay. The inner panel is a beautiful bird�s eye maple veneer. The brown cherry finish will blend well with many current color themes. IN STOCK! A satin smooth finish has a thin polyurethane coating for an extremely durable finish over real wood. 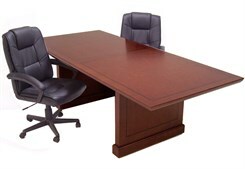 You will surely notice the difference between this and lesser quality conference tables by its solid and substantial feel. Table tops are a full 1-7/8" thick and legs are 2-1/2" thick with a 4" thick bottom apron! A vertical cross brace mounts between both legs for additional support. This extra thick top will not allow bowing even if users lean or sit in the middle! Definitely built to last. * Hand crafted in genuine wood veneer and solids only - no laminates. * Table tops are heavy 1-7/8" thick for solid, substantial feel. * Detailed reverse beveled edges in solid wood. * Shape and edge design allow for extended size tables with end to end use. 8' table includes two bases and single stretcher support. Measures 94-1/2"L x 41-3/4"D x 30"H. Shipping weight 242 lbs. PRICE INCLUDES SHIPPING! (Truck shipment - see Terms & Conditions). IN STOCK! Extend your table in 4' increments as needed. Includes 47-1/2"L x 41-3/4"D table top, support leg and stretcher support panel. Shipping weight 121 lbs. PRICE INCLUDES SHIPPING! (Truck shipment - see Terms and Conditions). Please allow 1 week for delivery. IN STOCK! 1 - 9 $149.00 ea. 10 - 19 $139.00 ea. This plush, tufted swivel office chair in genuine leather is a tremendous value at our low Modern Office Special Offer price. Makes an ideal choice for the executive conference room with its comfortable feel and prestigious appearance. 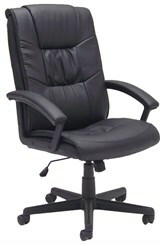 Also works well as an all day executive office use chair. Deep padding keeps you in comfort all day long. Chair also features padded leather angled armrests for a neat fit under any desk or conference table, pillow-tufted seat and back for extra deep comfort, a gas lift height adjustment, and a tilt/tension control with forward lock. Recommended for medium to large size users up to 250 lbs. Can be comfortably used as an 8-hour chair. Seat measures 20-1/2"W x 19-1/2"D. Back is 20-1/2"W x 27"H. Measures 26"W x 28"D x 41"-45"H overall. Ships unassembled. Shipping weight 37 lbs. All components exceed ANSI/BIFMA commercial use requirements. Meets CA fire foam approval. 5-Year Limited Warranty. PRICE INCLUDES SHIPPING! IN STOCK!